Leaf Litter: Do the Benefits Outweigh the Work? For the homeowner who feels the need to rake leaves and pine needles, the task can be something of a minor nuisance. The showers of earth-toned leftovers appear suddenly and at inconvenient times, and their removal is never added to a chore list without dispute. Disarray aside, these organic remnants provide far more benefits than problems. Their suburban untidiness becomes an insulating blanket which nurtures plants, animals, and insects with time released nutrients for use by the efficient and fortunate in the wild and those of us in civilization. First and foremost, leaf litter is critical to the water holding capacity of the woodlands. The dried leaves, needles and twigs absorb and shade rainwater from the evaporative effects of the sun and wind. When heavy rains inundate the soil causing flooding and runoff, it is the leaves that act as part of the natural delaying system to minimize the negative impact on streams, creeks and rivers. The delayed or halted runoff provides time for water to be absorbed by the soil and be filtered by the natural screening capacity of this organic material. The moisture works in conjunction with native bacteria and fungus to convert the leaf litter into nutrients usable by plants and trees. While not as concentrated as commercial fertilizers, many of the same plant nutrients are present in the decaying leaf litter. 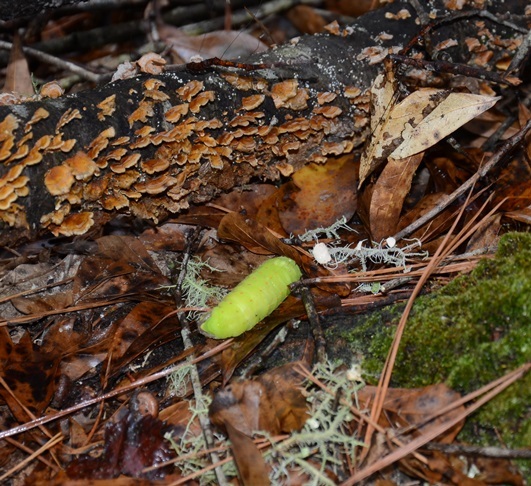 The decomposition is aided by a variety of insects and worms which nest in, eat and overwinter under the debris. The animal activity breaks up and stirs the elements along with inoculating microbes in the matter which speeds nutrient availability to plants and trees during ideal years. Luckily, the region’s leaf drop is spread over months with the plants and trees responding to the solar cycle and weather. Autumn, winter and spring each bring defoliation of specific trees and plants. During dry years the bug and bacteria activity slows in accumulated leaf litter, but the naturally occurring fire cycle continues the nutrient recycling under the tree canopies. The easy to burn material aides in controlling insects and plants that can aggressively overpopulate an area if unchecked. Controlled burns also prevent destructive wildfires which are harmful to all north Florida residents. While these uncontrolled fires do deposit nutrients, they have many negative effects which far outweigh this single benefit. January’s weather is part of a continuing natural succession which the native plants and trees incorporate to continue the wild beauty so common in the region. The current cold and rain will combine with the leaf drop to produce much growth in the next few months.